Group 1’s Electrolyte provides a balanced mixture of electrolyte salts. Electrolyte supplementation is valuable to horses suffering from severe exertion dehydration and fatigue. Why is it important to replace electrolytes? Horse sweat is a highly concentrated electrolyte solution that increases a horse’s water uptake. Electrolytes are made up of minerals such as sodium, potassium, calcium and phosphate and, all electrolytes are lost in sweat to some degree. 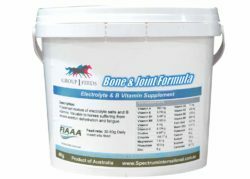 Each electrolyte plays a vital role in the functioning of a horse’s body, particularly when undertaking intense exercise. Therefore, it is very important that the correct balance of electrolytes is available to the horse to ensure it can continue to function successfully when under exertion. Common electrolytes include sodium, potassium, chloride, and bicarbonate. Each electrolyte must be kept in correct concentration, rapidly loss of one electrolyte will lead to electrolyte imbalance, this causes electrolyte deficiency diseases. So, a balance of these electrolytes in the body is important for maintaining the normal function of cells and organs.